'Shop Contest: Make Hope County Weirder, Winners! Hope County has zombies and apocalyptic cults, but I wanted it to be weirder, and you definitely didn’t disappoint when I asked you to add odder things to Far Cry 5. If the Far Cry universe can extend to any zone, then I think that we should see a wider variety of creatures, places, and people when traveling around Hope County. After all, this is a world with confirmed aliens and mysterious government agents running around. There should be some weird stuff in there! Our winner this week is Villings. I’ll be honest and tell you that this was one of the most difficult ‘Shop Contests that I’ve had to judge in a minute, and that’s because the entries were of such high quality. Villings wins out, though, for the sheer compositional skill on display here. 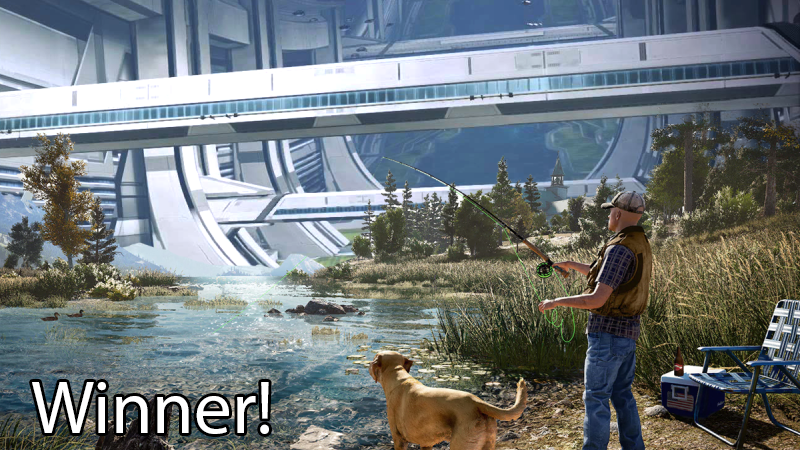 That dude and dog are just fishing the heck outta that space station. We have lots of honorable mentions, though, and I encourage you to go look at all of the entries in the comments on the original thread. Gaseous Clay puts the sadness of growing up right into the heart of Montana. J P A C understands the weirdest thing that can happen is when the fish bite back. netsquire has also identified another scenario where the fish seem more than a little pissed off. Hunter Zaroth found the best fisherman in all of video gaming to help out with the relaxation. AngryDev is fishin’ for something else. Phobox knows that the good fish are down deep! Real deep. Very, very, very deep beneath the crust of the earth. RetroBoogie found a friend who is good at helping out with fishing. Chris Mc has a condition. Done With Kinja needs to explain why Judd Nelson is leaving. Is he over it? Did he win something that day? What’s detention like in Hope County? sciteach appears to be producing some kind of war between these space beings and the denizens of Hope County. Where’s that big ole rolling ball? Mrichston found the guy who encourages you to do it. Yes! Bob has gotta catch ‘em all. religiousjedi knows the true enemy of Hope County’s denizens: that rude dog who snickers.